If you’re already using the HP ePrint Enterprise solution, this app will make your mobile printing even more mobile! 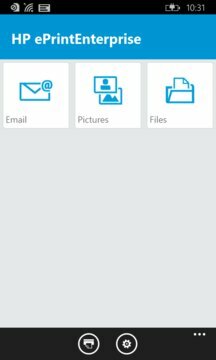 The HP ePrint Enterprise app adds the ability to easily print email, documents, and more right from your phone or tablet. HP ePrint Enterprise is a private cloud-based solution that enables secure printing from mobile devices to any registered printer on your corporate network. The HP ePrint Enterprise solution must be purchased separately. For more information, go to www.hp.com/go/eprintenterprise. 1. Open the HP ePrint Enterprise app and select the content you want to print (email, photo, documents). 2. Review the list of network printers and select your printer. 3. Go to your selected network printer and get your printout. 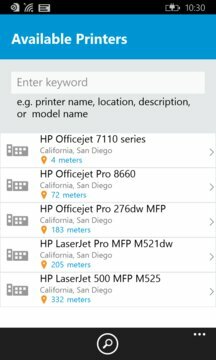 For printing to HP printers without using private cloud based solution, check the HP AiO Remote app. •Works on Windows Phone 8.1. *Note: Some Chinese, Japanese, and Korean emails may not print properly.